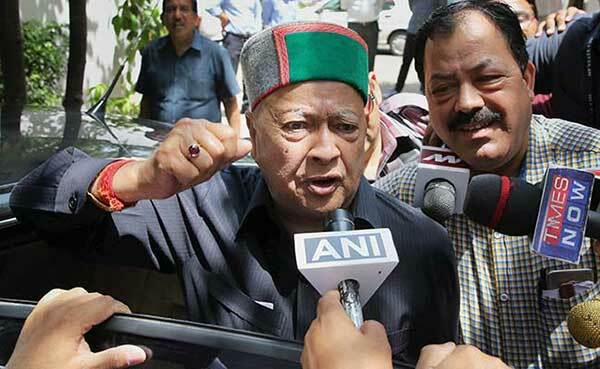 NDTV News|| Himachal Pradesh Chief Minister Virbhadra Singh looked tired but managed a smile to the waiting media persons as he walked out of the Enforcement Directorate office in Jamnagar in central Delhi on Thursday evening. Virbhadra Singh, 82, was questioned by the Enforcement Directorate for nine hours in a money laundering case which was registered in September 2015. Mr Singh was among three Congress leaders who were questioned by the probe agency in separate cases of money laundering. Former Haryana Chief Minister Bhupinder Singh Hooda and Congress party treasurer Motilal Vora are the other leaders who are under the scanner of the Enforcement Directorate. The probe agency has already attached 14 properties of Mr Singh. The Central Bureau of Investigation has already filed a chargesheet against Mr Singh, his wife and other associates in a disproportionate assets case. The Himachal chief minister is alleged to have received Rs. 6.1 crores that did not match his known sources of income. His is alleged to receive this money as kickback from a steel company when he was UPA’s steel minister between 2009 and 2011. Mr Singh, who faces assembly elections in Himachal in October, put up a brave face. “Safarorisi ki tamanna ab humare dil main hai. Dekhna hai zor kitna baajue kaatil main hai (The desire to make a sacrifice is in our hearts, let us see what strength there is in the arms of our executioner),” Mr Singh had told the media as he walked into the ED office in the morning. Sources say Mr Hooda and Mr Vora too were grilled this week for over 12 hours by the Enforcement Directorate to probe an irregular land allotment to Associated Journals Limited, the company that owns the defunct Congress newspaper – National Herald – at Panchkula by the Hooda government in 2005. The Congress accused their leaders are being targeted, a charge rejected by the government. “There is no political vindictiveness in such cases. Government agencies are independent to investigate such cases,” said Information and Broadcasting minster M Venkaiah Naidu.